Our 2018 Impact Report will be published in the coming weeks. We will be highlighting the successes and challenges of our work last year as a network. As much of our work is with community groups and human rights defenders overseas, and lobbying mining companies who often evade legal obligations, progress is slow and success infrequent. Therefore, it is difficult to measure the impact of our work in a typical NGO style. However, quotes from some of our visitors from mining-affected communities from previous years speaks for itself. 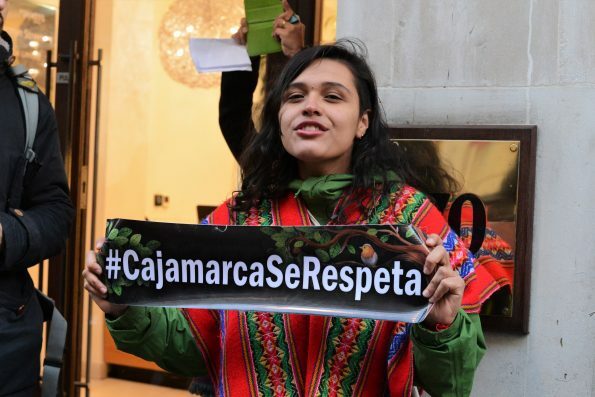 Camila Mendez is a land and human rights defender from Colombia, resisting mining company AngloGold Ashanti’s proposed mine in the village of Cajamarca. She is a member of the SocioEnvironmental Youth Collective of Cajamarca and Network. Camila visited the UK in November 2017, for a week of action, called Rise, Resist, Renew: Alternatives to Mining, around London’s annual Mines and Money conference. As part of the week, London Mining Network organised a walking “Toxic Tour” of six mining and financial companies that have their HQs in central London that was attended by nearly 50 people. Camila is pictured outside Paulson Europe, a finance company that invests in AngloGold Ashanti. “Today we did a tour where we were visiting the offices of different multinational companies that have operations in our territories. But when people stand up and reject these kind of projects, we realise we are not on our own. What has happened today is lots of different communities, their voices have come together, not just representing one community but a collectivity of voices uniting.” Camila Mendez in Resisting Mines and Money.